Around this time of year, when you walk along the narrow streets of Holland, you are guaranteed to smell the lovely, spicey, clove and nutmeg riddled smells of hachee. And if you stand still and concentrate on the mixture of smells coming from any traditional Dutch kitchen, you might be able to detect a sweet and sour undertone, a bit cabbage-like, but not much. You'd be so right! 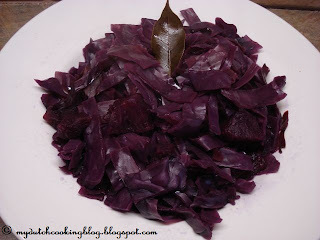 Red cabbage, braised with apples, is THE vegetable to serve with hachee and boiled potatoes. It's a typical Dutch winter dish. Americans usually don't care for fruit in their foods, but you may want to give this a try. The sweetness of the apple combines perfectly with the tanginess of the cabbage and the vinegar, and makes for a beautiful mix. Peel the outer, tough leaves off the cabbage. 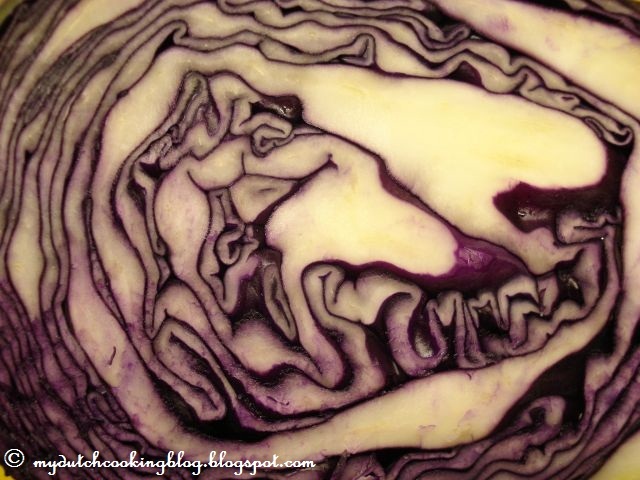 Cut the cabbage in half, then each half in half again. This will give you an easy opportunity to cut out the core which is tough and bitter. Slice each quarter in thin strips (I prefer a chunkier strip). Rinse the cabbage and add to a Dutch oven. Pour in enough water to cover the cabbage and set it on the stove. Add the bay leaves, cloves and cinnamon stick, cover and bring to a slow boil. Stir in the wine or the vinegar, add the sugar, stir and cover again. Let it slowly braise on the back of the stove. In the meantime, peel, core and quarter your apples. Add them to the cabbage, and slowly simmer for another thirty minutes, or until the cabbage is soft. Taste, adjust with salt and pepper. If you like it sweeter or tangier, add a bit more sugar or vinegar. 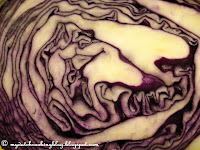 Red cabbage also pairs very well with game: rabbit, hare, venison and elk. 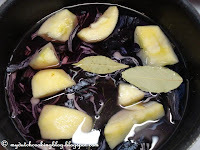 I love "Rode Kool" I am going to make this recipe today although I wont use a cinnamon stick instead I mix cinnamon into the wine and sugar mixture , it brings memories back from the time I was still lived in the Netherlands. An American friend of mine suggested a variation that replaces the apples with slices of unpeeled orange. It's surprisingly good, especially when you stick the odd clove into the orange peel. I also like using a cooking sherry instead of vinegar. As the fridge magnet in the kitchen says: "I cook with wine. Some even goes in the food!" Found your site a couple of days ago and loved it. Even for a dutch person this is good reading. Rode kool met appeltjes is eaten at our home with bloedworst (bloodsausage). It sounds nasty but is delicous. Found your website a few days ago. Being Dutch and a bit homesick - living abroad-, I was looking for some old-fashioned Dutch recipes. Making "Rode Kool" with apple and Hachee. Thanks for the recipes. Good recipe. Better to put thd vinegsr and apple towards the end of cooking the red cabbage.Makes the cabbage ready faster.